I always thought Charlotte Russe was a store for teenagers in the mall. 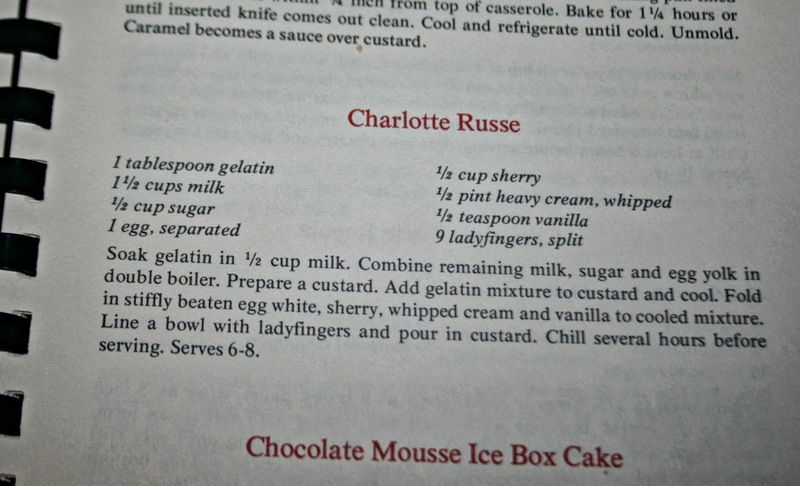 Until I was flipping through my vintage Virginia Hospitality cookbook and found a recipe titled Charlotte Russe. According to Wikipedia, Charlotte Russe is a dessert created by French Chef Marie-Antoine Careme who named it in honor of his former employer George IV's child, Princess Charlotte, and his current employer Czar Alexander I (russe in this case being the French word for Russian) A dessert I'd never tried? Well, then, I had to make it. Of course this dessert had all the elements of cooking I don't like. 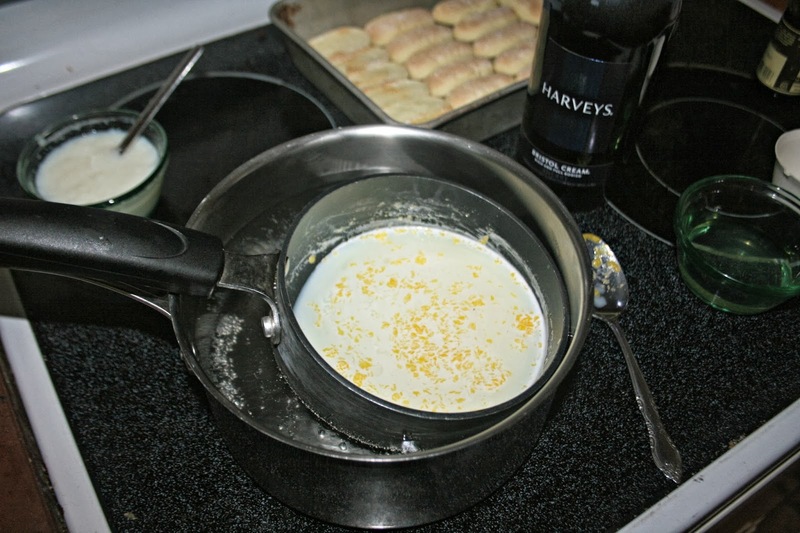 The use of a double broiler, gelatin, heavy cream and raw egg. Yuck! But I wasn't going to let that stop me. My first obstacle arose when I couldn't get the custard to set up. Seems I cooked that custard for hours (not really - maybe 20 minutes). Finally I took it off the heat and let it cool. It still wasn't thick like a normal custard. 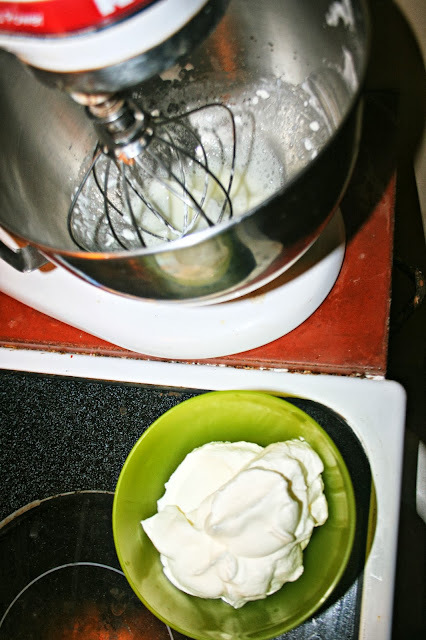 I got my heavy cream whipped up no problem, but I ran into an issue with the egg white. It just wouldn't stiffen up. I even got the boys ready for bed - all while whipping that white. Nada. Then I realized - I was supposed to put that raw egg white into the dessert and it would never be cooked. Now I am a champion raw egg eater in the form of cookie dough, brownie batter, and cake batter. I rationalized that the alcohol in the sherry (which also would not be cooked) might kill the salmonella in the egg white, but in the end, since it would not firm up anyhow, I just left it out. I mixed my concoctions together and they really didn't look very appetizing. 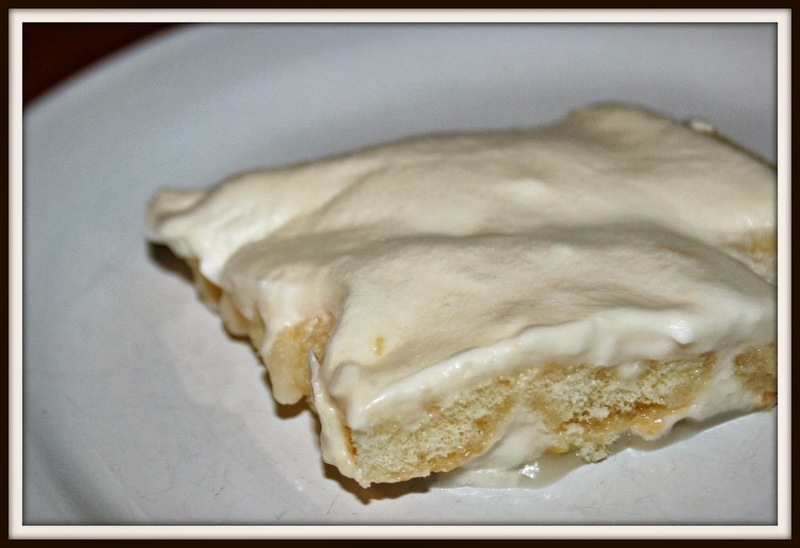 I didn't have much hope as I poured it over the ladyfingers and stuck it in the fridge for the night. Overnight, a miracle happened. The darn thing set up! I'll be honest here. It's not my favorite dessert. If you love sherry (I do have an appreciation for sherry in food, thanks, Dad!) and you love heavy whipped cream, you'll enjoy this. As for me - it's edible and not bad, but this is one recipe I won't be making again. At least now, though, I can say I've tried it! Readers, have you ever had Charlotte Russe? I think I would just try the sherry and let it go at that. My wife might get into all of that as I cook the meals and she does the desserts around here. No, I haven't tried it, but you have inspired me! Once my kitchen is back up and going, I will try it. oh i didn't know that but i used to shop there all the time as a kid and now my own daughter does! I want to try this. It looks delicious! have a great day, lisa! Been to the store, but never heard of the dessert. Never, and I don't think I want to either! My middle kid wants me to make Turkish Delight. He's been reading CS Lewis. I'd say you put a lot of work into making it work! I think I prefer the store. I am to lazy for this stuff. Woah, I had no idea! I've heard of the store before but never knew there was more to the name. Fascinating! May May used to make Charlotte Russe with some kind of apricot liquor...or maybe an apricot brandy. It just sounds too complicated for me!!!!! I make the biggest mess in the kitchen these days!!!!! Sounds like a ton of work for a ok dessert. Glad you tried it ......then I won't have to. I'll take your word for it. First of all, I want to thank you for all the love you leave for me on my bloggy. I feel your love and am so thankful! I like deserts,,,, I like animal cookies. I've never had Charlotte Russe. Looks yummy-AND it looks like we have the same mixer, too! That's fun!